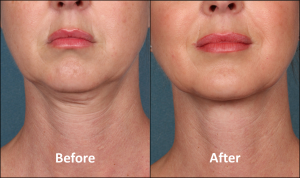 Introducing Kybella Chin Fat Reduction Available at Cosmetique! Are you bothered by that pesky pouch under your chin? We are among the first doctors in the United States to offer Kybella™. The new Kybella is the first and only FDA-approved injectable treatment used to improve the appearance of a double chin. Using tiny, virtually painless needles, Kybella is gently injected into the area underneath your chin where it permanently dissolves the fat. Don’t let your double chin get you down. Chin up with Kybella now available at Cosmetique! Call today for your complimentary consultation!